©2011 Guy Haley (P)2011 Brilliance Audio, Inc.
Every year I suggest that Audible give "frequent flyers" the ability to give one book per year a 6th star. This is mine. It is a near-future detective buddy story -- but much more. Haley weaves a Peter Hamilton-esque sense of mixing a real world storyline with a related in-machine story. I was also reminded of two of my all time favorite series -- Richard K. Morgan's Altered Carbon/Kovacs and Charles Stross' Halting State/Rule 34. The narration was extraordinary as well. 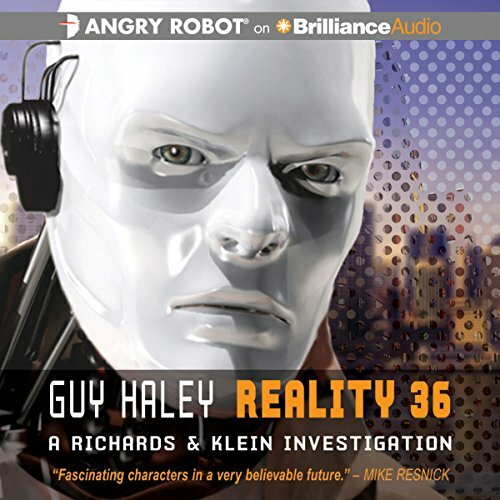 Guy Haley's Reality 36 is set in the future when advanced AIs are commonplace and the virtual reality of gaming worlds has evolved to serve as alternate universes. The tale boils down to a complex detective story with a unique team of a Level 5 AI (quite advanced) and a semi-retired military cyborg. The crime under investigation concerns the death of a prominent AI researchers who was also an AI rights activist. Various competing agencies and freelancers are on the trail and the action is quite intense with no clear idea for what started it all. The sci-fi elements are a solid blend of AI with a quirky VR world with some robotics thrown in for good measure. The weakest component is the formulaic construction of the VR world. The detective sleuthing is well done with good pacing and numerous plot twists. The chemistry between the partners is entertaining and results in a great team. The narration is quite good, although the overall story construction is a bit slow in the beginning in terms of plot development, while then ending could use a bit more closure. The Tech was cool. A picture of the future that was different and possible. female protagonist was very refreshing, the andriod and cyborg not as much. And then the story's ending was disapointing. Yes, I would, especially to friends conversant in cyberpunk. It has that old Gibson-esque feel, with maybe a little Stirling sprinkled on top. If you’ve listened to books by Guy Haley before, how does this one compare? I rather liked the Jagadieth scenes. Very well done. It's 2015. We live in a cyberpunk world. It's rare to see the form done today, and to do it with any skill rarer still. While "Reality 36" isn't perfect, it at least explores a novel concept (are virtual lives of the AI class entitled to be left alone? ), even if the stakes do not seem particularly high. I was in the market for a new audiobook, and browsing not just authors but narrators that I like. Michael Page could, in my opinion, read out last week's shopping list and make it sound ascerbic and witty. Even better, his characterisation is distinct and his accents spot-on. And if *that* doesn't pique your interest, nothing will!